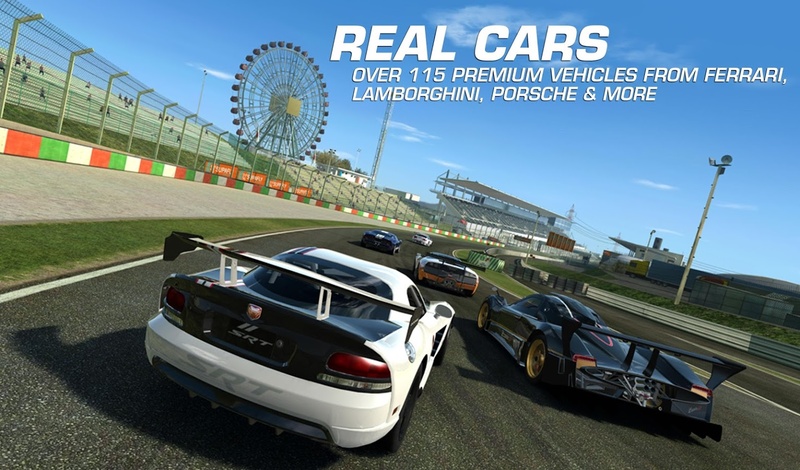 Real Racing 3 is the award-winning franchise that sets a new standard for mobile racing games â€“ you have to play it to believe it. Real Racing 3 features an ever-expanding roster of officially licensed tracks with 39 circuits at 17 real-world ********s, a 43-car grid and over 140 meticulously detailed cars from top manufacturers. Plus Real-Time Multiplayer, Social Leaderboards, Time Trials, night racing, and innovative Time Shifted Multiplayerâ„¢ (TSM) technology, allowing you to race anyone, anytime, anywhere. Take the wheel of over 140 intensely detailed vehicles from iconic manufacturers like Ford, Ferrari, Lamborghini, Aston Martin and Mercedes-Benz and test your skills on an authentic 43-car race grid â€“ the most epic racing experience on any handheld. Burn rubber on a full lineup of 17 real tracks in multiple configurations from top worldwide ********s, including Silverstone, Hockenheimring, Le Mans, Dubai Autodrome and many more. Go bumper to bumper with friends and rivals in global 8-player, cross-platform, real-time racing with drafting. Or drop into any race to challenge their AI-controlled versions in Time-Shifted Multiplayerâ„¢. Compete in over 4,000 events including Cup races, Eliminations and Endurance challenges. Choose from a wide range of upgrades to maximize your carâ€™s performance. Customize your car with a huge collection of paints, vinyls and rims. View the action from a variety of camera angles, tweak the HUD and fine-tune the controls to your personal preference. Powered by the remarkable Mintâ„¢ 3 Engine, Real Racing 3 features detailed car damage, fully functioning rear view mirrors, and dynamic reflections for truly HD racing. Enjoy a rich, next-gen game with the most advanced cross-platform social and competitive racing community ever. Real Racing 3 delivers it all and pushes the boundaries with every update.